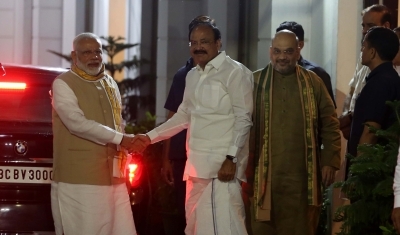 New Delhi, July 18 (IANS) Senior BJP leader M. Venkaiah Naidu on Tuesday filed his nomination for the post of Vice President after which he declared that, if elected, he will strengthen the parliamentary democratic system and uphold the dignity and decorum of the office. The 68-year-old Naidu, who quit as Information and Broadcasting and Urban Devlopment Minister after being chosen as the ruling NDA’s Vice Presidential candidate on Monday night, filed his nomination before Rajya Sabha Secretary General Shumsher K. Sheriff, who is the Returning Officer for the August 5 election. Prime Minister Narendra Modi, Bharatiya Janata Party President Amit Shah, senior leaders L.K. 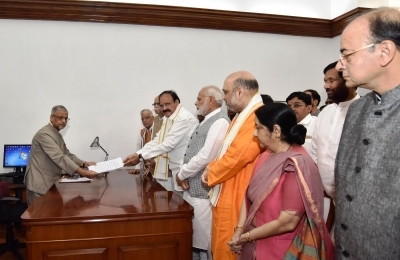 Advani, Sushma Swaraj and several others, including V. Maitreyan, leader of the AIADMK faction headed by O. Panneerselvam, accompanied Naidu when he filed his nomination papers. The Telugu Desam, Telangana Rashtra Samiti, YSR Congress and the ndian National Lok Dal are among the parties which have extended support to Naidu. He is comfortably placed against UPA candidate Gopalkrishna Gandhi in the electoral college consisting of 771 members of both the Houses of Parliament, including the nominated members. He said the Rajya Sabha is an important institution and the institution’s Chairman has got his own importance. Recalling that the office was held by great sons of the country like Sarvepalli Radhakrishnan, Zakir Hussain, Justice M. Hidayatullah, R. Venkatraman, Shankar Dayal Sharma and Bhairon Singh Shekhawat, he said he was fully aware of the responsibilities and would uphold the dignity, decorum and traditions set by his worthy predecessors and work to further strengthen it. Naidu said it was an honour to be nominated as a candidate for the election to the Vice President’s office and thanked Modi and Shah for choosing him and the other leaders with whom he had worked all these years. He also thanked all the NDA constituents and leaders of the YSR Congress, AIADMK, Telugu Desam Party and Telangana Rashtra Samithi for extending support to him. Naidu said he would not take some names of the leaders who have informally extended support to him till they make the formal announcement. Tracing his origins, Naidu said he was from a very ordinary, humble, agricultural background without any great family background. Having lost his mother when he was 18 months old, he had treated his party as his mother. “From today onwards my role is going to be different. It’s a new responsibility. I am not going to say anything against anyone,” he said, adding that he has no intention to campaign for the election. Naidu said there is no need for him to campaign as all the MPs who are going to vote know him too well. He said that he would not be going to party office though he would meet partymen in a different capacity. He referred to his resignation from the Council of Ministers but said he would continue to be an MP till the Vice President’s election. Naidu is comfortably placed against opposition-backed Gopalkrishna Gandhi as the ruling National Democratic Alliance (NDA) has a clear majority in the Lok Sabha. The scrutiny of nominations for the August 5 election will be held on Wednesday.